A gathering of 43 mayors and 85 high-level political representatives met in Copenhagen on 13 February to share experiences and ideas for how to place health and well-being at the heart of urban development. This group – collectively representing nearly 125 million people living in urban centres in the WHO European Region and beyond – adopted a visionary document that presents a transformative approach to creating happier and healthier cities for all. In opening this historic Summit of Mayors, WHO Regional Director for Europe Dr Zsuzsanna Jakab, emphasized the vital role of cities in achieving the 2030 Agenda for Sustainable Development and its 17 Sustainable Development Goals (SDGs), with the ultimate aim of reducing inequalities and improving the health of all people. She noted that, while cities are in part responsible for the challenges facing the world, city and local governments have great power to be a crucial part of the solution, as well. The WHO European Healthy Cities Network offers an important platform from which cities can work together on the most pressing issues. This year marks the 30th anniversary of the European Healthy Cities Network, making it the longest running WHO network in the world. Following Dr Jakab’s remarks, Tony Fitzgerald, Lord Mayor of Cork, Ireland, and Chair of the Healthy Cities Network Political Vision Group, presented the Copenhagen Consensus of Mayors. The Consensus, which was developed through a comprehensive consultation process over 18 months, focuses on 6 key areas: peace, planet, place, people, participation and prosperity. The first session placed the sustainable urban agenda within the broader context of global and regional frameworks. John Ashton, Summit Chief Rapporteur, called out to city councils and local governments to realize their full power and ability to deliver on the SDGs. Action is needed, he said, and around the world we have seen examples of action being undertaken with local interpretation. Oleg Kuvshinnikov, Governor of the Vologda Region, Russian Federation, pointed out that cities are key agents for change. He drew from the experiences of the Russian Association of Healthy Cities, Districts and Villages of working to improve health and living standards, and thus contributing significantly to increasing life expectancy in this region of the Russian Federation. Murat Daribayev, Vice Mayor of Almaty, Kazakhstan, presented the Almaty 2020 strategy, which has been conceived as a direct descendant of the Health 2020 European health policy framework. He noted that October 2018 will mark the 40th anniversary of the Alma-Ata Declaration, which set the foundation that led to the creation of the Healthy Cities Network. The anniversary will be celebrated at a conference hosted by the city on 25–26 October 2018. Almaty will also host a pre-event for the Healthy Cities Network. Sir Andy Haines, Professor of Public Health at the London School of Hygiene and Tropical Medicine, gave a keynote speech stressing that the future of planetary health for generations to come will depend very much on the policies cities put in place now. He underlined 3 interlinked challenges to building sustainable cities: reducing the environmental footprint, increasing resilience to environmental change, and promoting and protecting health. The session concluded with a roundtable of mayors calling for scientific evidence to make a case for prioritizing health in cities. The panellists noted the important role that national Healthy Cities networks play in bringing cities together on difficult issues. In order to better tackle environment and health issues in particular, Deputy Mayor Victor Everhardt of Utrecht, Netherlands, announced the creation of a new Healthy Cities Network working group on environment and health. Professor Rodrigo Guerrero, former mayor of Cali, Columbia, opened the session with a keynote on returning to fundamental public health principles to develop evidence-based polices to tackle risk factors, using public safety and urban violence as an example. He stressed that the methods are more important than the individual outcomes. The subsequent roundtable of mayors covered issues ranging from urban renewal, to celebrating education and culture, to providing migrants and refugees with essential support, including health-care services. Paolo Veneri, Head of Territorial Analysis at the Organisation for Economic Co-operation and Development (OECD), presented on well-being and inclusion in cities, highlighting the 2016 report “Making cities work for all”. High levels of inequality within cities can translate into special segregation, but with significant differences in the administrative fragmentation of metropolitan areas within the OECD countries. Promoting inclusive growth in cities requires good quality jobs for all, equitable access to education, inclusive housing policies, accessible and affordable transport, and healthy neighbourhoods. The session’s roundtable of mayors tackled the need for evidence to support policy-making, the positive impact that community health can have on citizens, and using smart technologies to improve quality of life. During the course of the day, participants had the opportunity to attend 2 side events. The first side event, on migration, noted how it is a driver of urbanization. Interventions by the panellists illustrated how many cities experience the common challenges of integrating migrants in an equitable way and tackling language barriers. Housing is one of the biggest challenges, both short and long term, as well as providing much needed support to unaccompanied minors. The design of cities impacts how efficiently they are able to integrate migrants. At the side event on gender and urban health, Isabel Yordi Aguirre, Programme Manager, Gender and Health, WHO/Europe, presented on the WHO/Europe initiative to develop a strategy on the health and well-being of men for the European Region. This strategy will address challenges for men’s health while also engaging men in the gender equality dialogue. Specific experiences with designing health programmes and services for men were shared by representatives from France, Ireland and Sweden. Panellists emphasized the need for interagency, community-based initiatives and highlighted the potential to find win–win strategies that have a positive impact on the health of both men and women. Shortly before 17:30, the Copenhagen Consensus of Mayors was officially adopted by acclamation. Dr Jakab shared her aim to have it signed by 20 000 mayors by 2020 and encouraged the members of the Healthy Cities Network to take up this challenge. The Consensus affirms political commitment to the role of cities in creating a healthier and happier future and provides a strong mandate for the Healthy Cities Network. 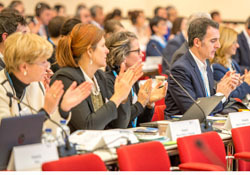 Furthermore, preparations are being made to designate a WHO European Capital of Health and Well-being for 2020. Monika Kosinska, WHO/Europe Regional Focal Point for Healthy Cities, announced that by October there will be a strategy and plan for adoption to move forward in the next phase of the Network. Deputy Mayor of Belfast Sonia Copeland extended a warm invitation to the 30th anniversary International Healthy Cities Conference 2018, to be held in Belfast on 1–4 October.